秦臻, 杨志军, 唐力, 王明志, 佘朋涛, 韩奎, 张黛. 西藏冈底斯带查隆花岗岩地球化学特征、锆石U-Pb年龄及其成矿意义[J]. 地质通报, 2019, 38(2-3): 231-241. 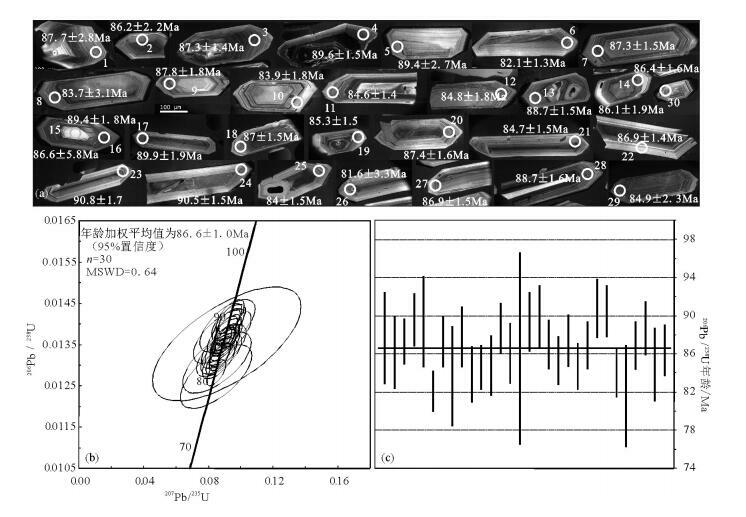 Qin Z, Yang Z J, Tang l, Wang M Z, She P T, Han K, Zhang D. Geochemical characteristics, zircon U-Pb age and metallogenic significance of Chalong granites in the Gangdise Belt of Tibet[J]. Geological Bulletin of China, 2019, 38(2-3): 231-241. Abstract: The Chalong granite is located in volcanic magma arc of the Mid-Gangdise belt. The granite petrologically consists of biotite granodiorite and granodiorite; the zircon U-Pb age of fine-grained granodiorite is 89.88±0.55Ma (95% conf., n=24, MSWD=0.43) and that of medium-grained biotite granodiorite is 86.6±1.0Ma (95% conf., n=30, MSWD=0.64). Their petrochemical characteristics indicate that they are high-K calc alkaline peraluminous "Ⅰ" type granite. The REE distribution curves are right-inclines, and the magma experienced differentiation to some extent. The trace elements Ti, Nb and P are relatively deficient. The intrusive rock resulted from the unidirectional subduction of the Yarlung Zangbo River crust, was formed in the volcanic arc environment, and was the product of intermediate acid magma with crust mantle mixing Characteristics. 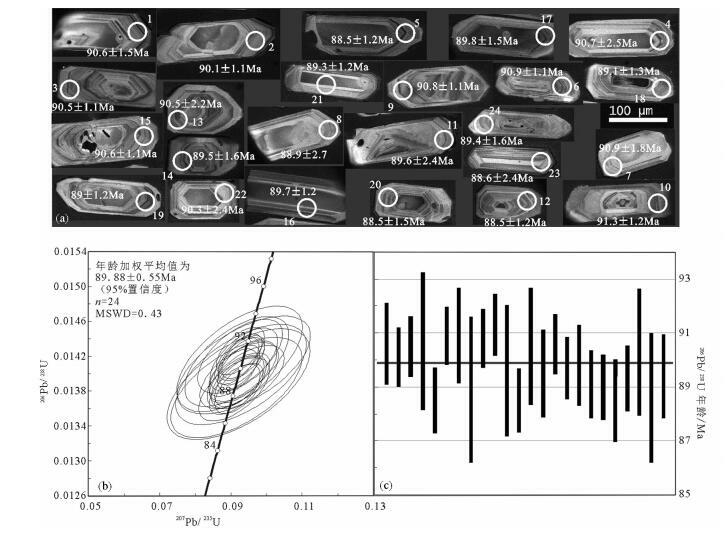 The genetic type of Chalong magnetite mineral deposit closely related to the intrusive rock is skarn hydrothermal superimposition type. Chalong magnetite mineral deposit has a similar metallogenic geological background to the discovered deposits in the area. 潘桂棠, 莫宣学, 侯增谦, 等. 冈底斯造山带的时空结构及演化[J]. 岩石学报, 2006, 22(3): 521-533. 朱弟成, 潘桂棠, 莫宣学, 等. 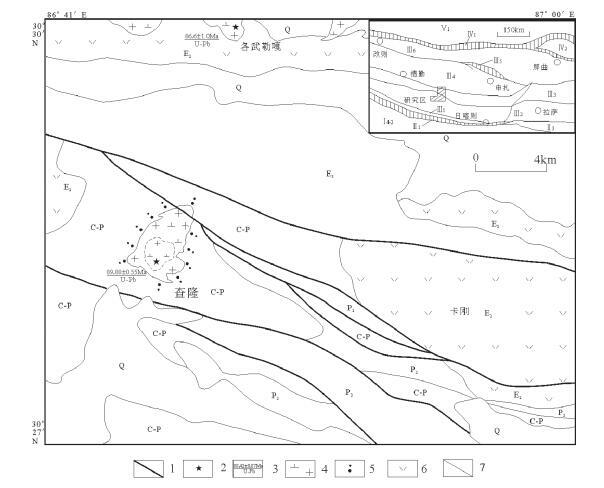 冈底斯中北部晚侏罗世-早白垩世地球动力学环境:火山岩约束[J]. 岩石学报, 2006, 22(3): 534-546. 王成善, 刘志飞, 李祥辉, 等. 西藏日喀则弧前盆地与雅鲁藏布江缝合带[M]. 北京: 地质出版社, 1999: 1-237. Anderson T. Correction of common Pb in U-Pb analyses that do not report 204Pb[J]. Chemcal Geology, 2002, 192(1/2): 59-79. Ludwig K R. Isoplot/Exversion 2.49. A Geochronological Toolkit for Microsoft Excel[C]//Berkeley: Berkeley Geochronology Center Special Publication. 2003, 1: 1-56. 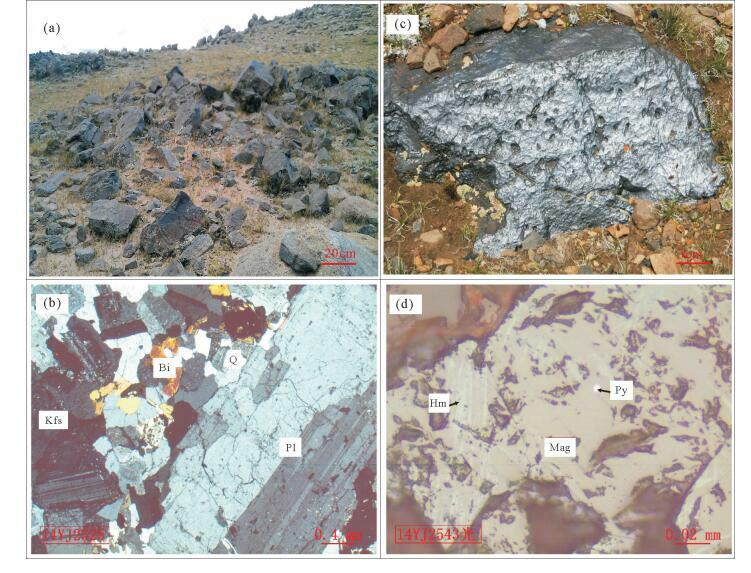 Middlemost E. Naming materials in the magma/igneous rock system[J]. Annual Review of Earth & Planeary Sciences, 1994, 37(3/4): 215-224. Rickwood P C. Boundary lines within petrologic diagrams which use oxides for major and minor element[J]. Lithos, 1989, 22: 246-263. Maniar P D, Piccoli P M. Tectionic discrimination in of granitoids[J]. Geological Society, Am. Bull., 1989, 1: 635-643. Sun S S, Macdonough W F.Chemical and isotopic systematics of ocean basalts: Implations for mantle composition and processes[C]//Saunders A D, Norry M J. Magmatism in the Ocean Basins. Geological Society, London, Special Publications, 1989, 42(1): 313-345. 管琪, 朱弟成, 赵志丹, 等. 西藏南部冈底斯带东段晚白垩世埃达克岩:新特提斯洋脊俯冲的产物?[J]. 岩石学报, 2010, 26(7): 2165-2179. 陈炜, 马昌前, 边秋绢, 等. 西藏冈底斯带中段以东得明顶地区晚白垩世花岗岩类锆石U-Pb年代学和地球化学证据[J]. 矿物岩石, 2010, 30(1): 83-92. 苟正彬, 汪雄武, 张强, 等. 西藏冈底斯谢通门-桑日地区查隆花岗岩类形成的大地构造背景及找矿意义[J]. 矿床地质, 2010, 29: 1085-1086. 李华亮, 杨绍, 李德威, 等. 冈底斯西北缘晚白垩世石英二长岩的年代学、地球化学、构造环境及成矿意义[J]. 大地构造与成矿学, 2014, 38(3): 694-705. 王力圆, 郑有业, 高顺宝, 等. 西藏吉瓦地区中冈底斯带岗在岩体晚白垩世的岩浆作用及构造意义[J]. 中南大学学报, 2014, 45(8): 2740-2751. 赵振华. 微量元素地球化学原理[M]. 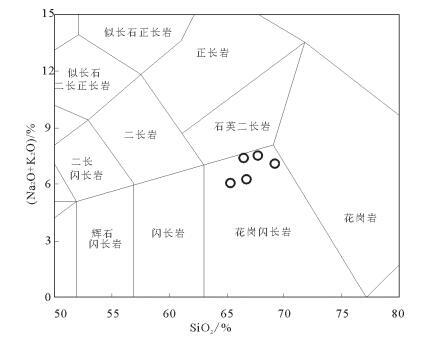 北京: 科学出版社, 1997: 1-495. Barth M G, Mc Donough W F, Rudnick R L. Tracking the budget of Nb and Ta in the continental crust[J]. Chemical Geology, 2000, 165(3): 197-213. Pfänder J A, Münker C, Stracke A, et al. Nb/Ta and Zr/Hf in ocean island basalts-implications for crust-mantle differentiation and the fate of Niobium[J]. Earth and Planetary Science Letters, 2007, 254(1): 158-172. Hofmann A W. Nb in Hawaiian magmas:constraints on source composition and evolution[J]. Chemical Geology, 1986, 57(1): 17-30. 秦臻, 杨克俭, 于恒彬, 等.西藏1: 5万许如错东加亚寺幅等4幅区域地质矿产调查报告. 2016.